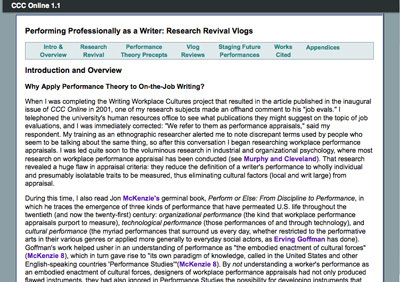 Six professional writers who participated in the original Writing Workplace Cultures research published in the initial version of CCC Online (2001) contributed to a revival of that research in its performative dimensions by self-producing video logs about their professional performances as writers. Jim Henry currently serves as Director of the Manoa Writing Program, the University of Hawaii at Manoa’s writing across the curriculum program that administers 500+ writing intensive courses per semester. He founded the UH Writing Mentors, an initiative that embeds graduate students in first-year composition courses to coach student writers.